The Coburg Football Club is excited to announce Peter McEvoy and Ryan Exon will share responsibility as co-captains for the 2019 Hard Yakka/Totally Workwear VFL season. McEvoy will be elevated after serving as vice-captain for the past two seasons, while Exon will take his existing leadership abilities to the next level, having previously captained the Oakleigh Chargers to the 2012 TAC Cup Premiership. The decision to appoint the duo as co-captains was voted on by the playing group, and then endorsed by the coaching group and senior club leadership. It will be just the 5th time in the club’s history where co-captains have been appointed, excluding the 2016 season where the captaincy was rotated. McEvoy has managed 40 VFL games for Coburg since debuting in round one of 2016, which could have been more was it not for an unfortunate leg break forcing him to sit majority of his debut season out. “It’s a massive honour and privilege to have this opportunity; there’s a lot of words that come to mind but my love for this club is the main thing,” McEvoy said. The following year, the 27-year old was awarded the Leading Goalkicker Award, and last season took home the Nick Carnell Leadership Award. Exon has managed 34 VFL games as a Lion since his debut in round one of 2017, and after an outstanding season missed the Jim Sullivan Best and Fairest Medal by just four votes. “I never really thought I would be given this role at a footy club, especially having spent a lot of time in the Development League during the early stages of my VFL career,” Exon said. “I just want to make the boys feel like it is a good club to be at, because it is. I also want to help us get back up the ladder where we belong!” Exon laughed. He backed this up with another impressive season last year, again finishing runner-up in the best and fairest count. Exon was also awarded the 2018 Jeff Angwin Most Courageous Player and 2018 Eric Lines Players’ Lion of the Year. Coach Leigh Adams looks forward to working with them and believes they are the right people for the role. 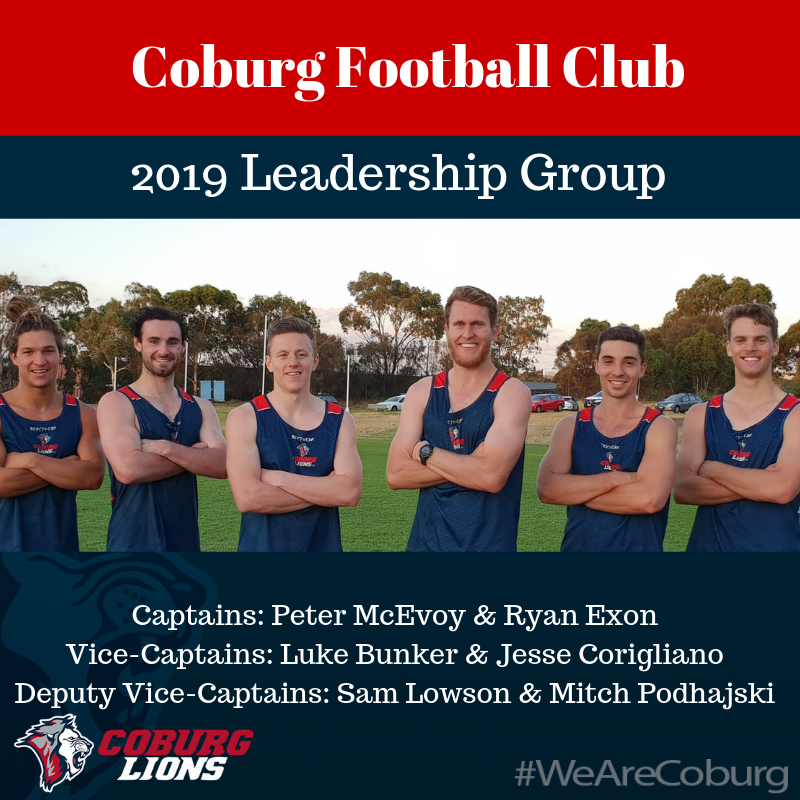 As for the remaining members of the leadership group, Jesse Corigliano and Luke Bunker will serve as vice-captains, while Sam Lowson and Mitch Podhajski have been named as deputy vice-captains. “We had a fantastic group of guys put their hands up to be in the leadership group and while we were impressed with everyone who came forward, we thought these six really stood out as future leaders of this football club,” Adams said. For Corigliano, having been on the Coburg FC list longer than any other player in 2019, to be named in the leadership group is a great reward for his persistence and motivation to succeed at VFL level. “I’ve been here a while now, so I really care about the club and feel privileged to be in a position where I can do everything possible to take the club forward,” Corigliano said. Corigliano hopes to bring energy and enthusiasm to the club, as well as “teaching young guys coming through different things that [he] has learnt throughout [his] journey”. Bunker, Lowson and Podhajski also feel honoured to have been named as new leaders, and hope to provide support in as many ways possible to McEvoy and Exon. “Being my third-year at the club, I’ve developed a strong love for it; I’m also a big believer in leading by example so I hope to set a strong example for the boys to follow,” Bunker said. “I feel like the way I play lives up to the three main values we hold at the club, and I want us to do well on the field but also I want to help out where I can for the boys if they need anything out of footy; I’m easy to get along with if they just need someone to talk to off-field,” Lowson said. “I’m quite young in comparison to the rest of the leadership group, but I feel I can represent the large majority of younger players we have on our list and make their transition from junior footy to VFL (easier) just like the older boys who are now leading the club did for me,” Podhajski said. To welcome in a new era of on-field leadership in 2019, and meet the playing group close-up, be sure to come along to our Family Day on Sunday March 17th from 11am at the Coburg-Moreland Bowls Club. Join our Leaders as Lions in 2019 by clicking here to sign up as a member this season!